Ohsweken, Ontario – November 29, 2013 – The 2013 Ohsweken Speedway season was celebrated on Friday night with the annual awards banquet at Carmen’s Banquet Hall in Hamilton. Jim Huppunen was honoured as the champion of the Corr/Pak Merchandising 360 Sprint Car Division, while Lee Winger was crowned Affordable Towing & Recovery Thunder Stock champion, Davey Boughton received HRW Automotive Mini Stock accolades, and Dusty DeBoer was awarded his trophy as champion of the Gale’s Auto Aftermarket Bomber division. Arrow Express, Corr/Pak Merchandising, Renway Energy, O’Neil’s Farm Equipment/Case IH, Burger Barn, Nathan Ackland State Farm Insurance, McDonald’s of Brantford and Paris, Klotz Canada Synthetic Lubricants, Rochester Knighthawks Lacrosse Club, Affordable Towing & Recovery, HRW Automotive, Gale’s Auto Aftermarket, Insta-Insulation, Active Green+Ross, Brant County Ford, Brown Auto Service, Best Western Cairn Croft Hotel, Clearshot Customs, The Evers Financial Group, Inc., Everything Automotive, Grisdale Racing Products, Grand River Metals, Hoosier Tire Canada, Grand River Power Sports, Jones Brown Motorsport Insurance, Kool Kidz Ice & Water, L.A. Music Brantford, Metal Works Power Coating, Middleport Mechanical, Mike Yarek Dodge Chrysler Ltd., Miska Trailer Factory, Six Nations Bingo, Strickland’s Automart, Townline Variety, 21st Century Signs, Woodstock Ford, Bradshaw Fuels, Best Western Brant Park Inn, Gerrie Electric, Rosewater Crafts, Steer Tech, TJSlideways.com, Epiphany Wedding, Canadian Warplane Heritage, Canadian Diabetes Association, Canadian National Autism Foundation, Hutch’s On The Beach, ImageFactor.ca Motorsport Designs & Photos, and ONDirt.ca Racing News. A special presentation was also made to Robert Meir, Territorial Sales Manager for Case IH Agriculture. Robert was instrumental in bringing CASE IH and Ohsweken Speedway together. Jim Huppunen, Jamie Collard, Mitch Brown, Chris Steele, Shane Ross, Todd Hoddick, Jamie Turner, Tom Huppunen, Derek Jonathan, Keith Dempster, Havard Daniels, Steve Goldner, and Conor Mahoney. Karl Sault, Cory Turner, Lee Winger, Chris Dickie, Ryan Turner, Dave Silverthorn, Jr., Jim Lampman, Bryce Richardson, Wyatt Van Wart, Jack Myers, Brad Herron, Mike Thorne, Jake Brown, Ryan Beagle, Rob Disher, Kevin Dawson, Terry Martin, Brett Rodwell, Robbie General, and Brittany Gyokery/Dale Gyokery (Team 4). Davey Boughton, Jason Lungaro, Alex Schuts, Laura Hughes, Chase Hess, Steve Miller, Jeremy May, Dave Goodacre, Dan Erskine, Jonathan Ayrton, Jon Janssens/Brandon Janssens (Team 66), Brittani Myers, Dale Gyokery/Jade Pelletier/Jeremy Hughes (Team 84), Jamie Goudge, Rob Twitchett, Mike Taylor, Kathi Dickie, and Mike Giberson. Jesse McDonald, Dusty DeBoer, Tim DeBoer, Brady Longboat, Max Chechalk, Wayde Thorne/Mark Thorne (Team 6), Clinton Nicholls/Chad Foster (Team 43c), and Dakota Potts/Chris Cowell (Team 03d). Ohsweken Speedway would like to thank all the racers, fans, staff, sponsors, and everyone else who made 2013 our best season yet! 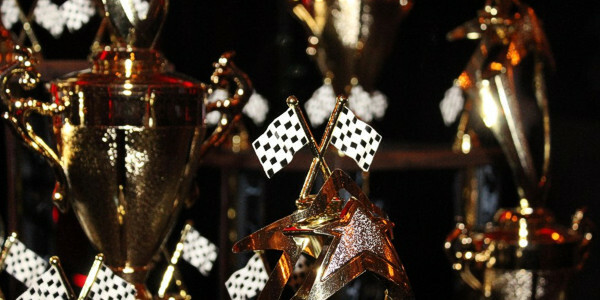 67 drivers/teams were honoured for perfect attendance in 2013, and the fans were treated to high car counts and great competition each night. 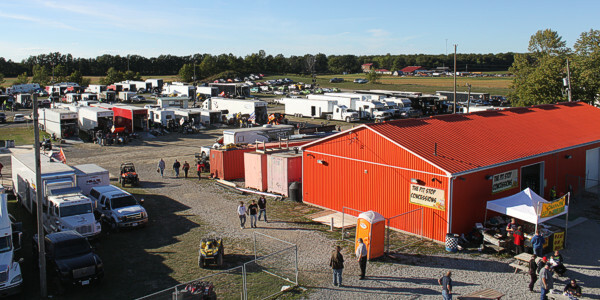 Weekly Friday night racing action is again on tap for Ohsweken’s 19th season in 2014, featuring Corr/Pak Merchandising 360 Sprint Cars, the new GM 602 Crate Sprint Car division, Affordable Towing & Recovery Thunder Stocks, HRW Automotive Mini Stocks, and Gale’s Auto Aftermarket Bombers. Please visit www.OhswekenSpeedway.com for more information. 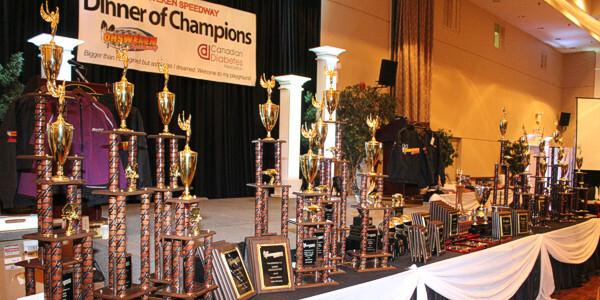 A FEW TICKETS REMAIN FOR THE OHSWEKEN SPEEDWAY AWARDS BANQUET; RESERVE NOW!